The Lowell National Historical Park, the Center for Lowell History, and the University of Massachusetts at Lowell are doing two studies: of immigrant businesses between 1870 and 1930 at over forty locations; and changing immigrant neighborhoods in the 20th century. First were the Irish and French Canadians of the early and mid 19th century. Then came the eastern and southern Europeans of the late 19th and early 20th century. Now there are Caribbean, Latin American, and Southeast Asian residents. Emigrés have played important roles in the city’s social, political, and economic life. Many immigrants who settled in Lowell worked in the city’s large textile mills. Some, however, ran businesses. 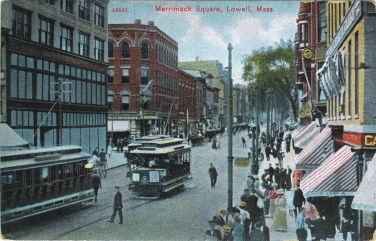 While city streets bustled with immigrant vendors in the late 19th century, many of Lowell’s ethnic entrepreneurs rented or owned their stores. Groceries, bakeries, funeral parlors, variety stores, and saloons were among the various enterprises run by men and women from other countries. They often transacted business in their native language, sold goods that were either imported from or similar to those found in their native land, and helped their fellow countrymen and women adjust to American life. Although a handful of these entrepreneurs became extremely wealthy, most earned just enough to support their families or even to acquire homes in the city. Still others among Lowell’s “penny capitalists” struggled in their businesses and faced continual hardship and poverty. Over forty commercial buildings, located in the downtown as well as in small commercial districts of Lowell’s neighborhoods, were selected for the immigrant business study. For the study of changing immigrant neighborhoods, the fourteen buildings chosen were mostly residences and community building in areas with successive waves of immigration.